SAS certainly could have done better. Since I checked in online I did not learn of this until, while waiting in the lounge, they announced that flights overseas would have "limited food choices." I figured that was not that big a deal, especially since I was seated in business class. On the way out I asked about it and they said that "limited" actually meant "absolutely none" and I was given a coupon, which I took to the airport 7-11 to get some sandwiches and snacks. There was a giant line at the 7-11 of course, but I made it to the flight. While annoying, there were some fairly positive results of the experience. The flight was actually much more pleasant without all the constant distraction of food and drink service. It makes me give serious thought to the virtue of flights, even long ones, which offer boxed food and drink that you grab at the gate and take to your seat to consume when you like. 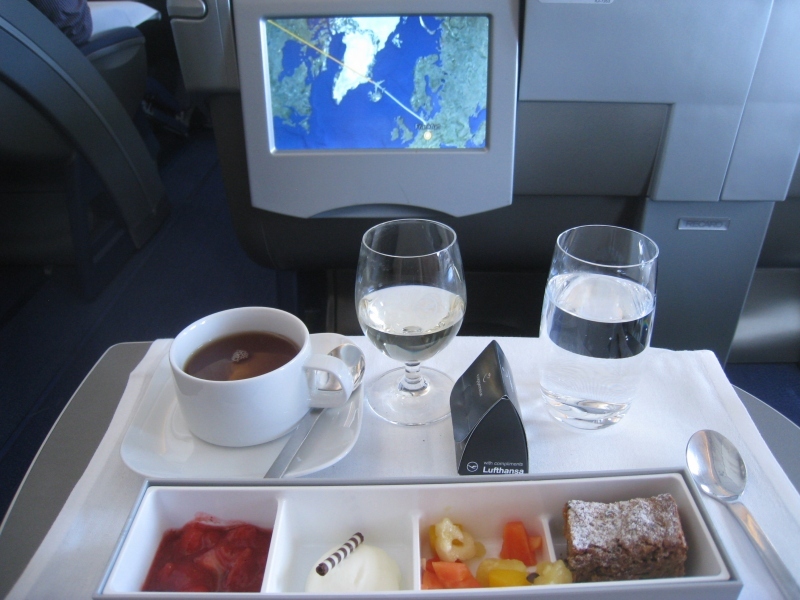 The idea of picking up a box of food is seen sometimes on short-haul flights and low-cost airlines. Some airlines also provide food only for sale, but on international flights it's usually included. Could this apply to long flights and luxury travel? The food service takes a huge amount of time on these flights. Typically it's 2-3 hours after take-off before the first meal (usually dinner) on a trans-oceanic flight is done. And they will start the arrival meal up to 2 hours before landing. That's many hours of noise and clinking of glasses and interruptions which interfere with the working, reading, screen viewing and most of all sleeping that people want to do on these flights. On an 11 hour flight (common from California) there can be less than 6 hours for sleeping. On the 8 hour flights from the east coast to Europe, it can be much worse. Some people sleep easily on planes, drifting off before take-off. I hate those people, and even if there is a 6 hour block of sleeping time, I will be lucky to get 4. The meals come at a real cost. They usually offer to not wake you for the breakfast, but that never works, I always get woken by the noises and lights of the breakfast service. Other downsides include the blocking of the aisles by the carts, and the large number of interruptions when you are working or watching a movie. I watch movies with noise cancelling headphones, so each time they ask me if I want more bread or drink I have to find the remote control, pause the movie, take off the headphones and then hear their question just to tell them no. I also find it strangely frustrating and distracting to observe the carts very slowly making their way down the aisle to you when you're at the back. In theory you should be able to just watch your show or do your work but it's hard to ignore, and we humans get anxious for our food or drinks to come. So this flight revealed some of the attractions of a flight with limited food service. Of course, it's not that easy. In many airplane seats, even in business class, there simply isn't anywhere to easily store a meal you bring aboard. If everybody puts their food into the bins, that's a lot of going to the bins. More troubling is keeping things cold. Drinks, because they taste better cold, and many foods will not stay fresh for 10 hours if it is not cold. You either have to solve that or limit the menus a lot. People would want ice for drinks and can't keep that at their seat. I bought juices which are tolerable at room temperature. The low service option might be cheaper as well. Truth is, airlines have gotten into a bit of an arms race on the food and it adds a fair bit to the ticket. On lower cost fares, they are working to eliminate it as one of the cost savings. I've seen crazy things -- Turkish airlines has them cook you fried eggs for breakfast. Etihad has no menu -- the chef just comes and asks you what you would like. We don't really need this in the air. This also means a lot less work for the flight attendants. In fact it could mean having fewer of them, also reducing the cost of the flight. Some minimum are required for safety reasons, but these would give better service with the time saved. You could just have carts of food boxes at the gate for people to grab from. Some will take two so they need to be ready for that. On the plus side, since unused boxes can go to the next flight -- these will be low-perishability boxes -- they will not run out of your selection. Special orders can also be possible. Depending on how much prep-time there is for the flight, boxes could also be pre-distributed and left on the seats or in the bins, with your name and seat number printed on them, according to pre-order. Many airlines already put a water bottle at every seat on long-haul flights. In coach, premium meals could also be given to those who pay more. And indeed, one of the premium options could be the old-style hot food service, though done without a serving cart (or in a special section of the seats) to avoid disturbing the other passengers. You could design stackable cups with ice at the bottom that are kept, stacked, in a freezer and distributed for chilling drinks. Hot drinks are a different problem. One could offer thermos containers for both hot and cold, or there might be drink service but not food. This would be a much shorter service period than the meals today. There could be a service bar in the more sparse galley. It would only be for exceptions. You can't have everybody lining up there -- it needs to be something that only a fraction of passengers use, and which they use at random times. Another option would be vending machines and drink fountains, possibly lots of them. They would not necessarily charge you money, but they would automate the dispensing and actually be quite efficient for soft drinks. There are also those issues the security people have had about "congregating" ever since 9/11. You could not use a bar or vending machines in turbulence, but you would get to have the stuff you brought at your seat, even if it's so bad the cart can't come out. One interesting idea would be a "cart" that hangs down from rails from the ceiling instead of rolling in the aisle. This has the advantage that people can duck under it (it could even have a way to be lifted up) and it does not block the aisle. Depending on the flight length, especially on red-eye flights, many would prefer to have the main meals on the ground rather than on the plane, and sleep or work for longer during the flight. On the 8 hour flights from the east of the USA and Canada to Europe, this is a very good idea. Indeed, many airlines offer a pretty good selection of food in their lounges, and some have "arrival" lounge access in Europe where you can get a decent breakfast. I have seen British Airways explicitly promote having breakfast in the arrival lounge instead. The problem is that other people are still having the regular food service, and if you're not an easy sleeper, there will still be lots of distraction during the meal service. To make this work you need a section where nobody is getting service, or at most they are using the low-service option described above. In addition, the on-ground meal should be as good as or better than the in-flight one. Certainly it's more comfortable. The other airline I flew on this trip is a small one called Air Baltic. While not too different from other regional airlines, they did a lot wrong and it should be a lesson for others. Air Baltic has extremely tight carry-on regulations -- a total of 8kg/18lbs for all your carry-ons combined. Since the typical roll-aboard bag is 3-4kg and a typical laptop bag with computer is going to be 3kg it's pretty much impossible for me to get my usual travel kit down to that weight. Many other airlines have restrictions, but Air Baltic makes a big point of enforcing them, and hopes they will force you to gate check -- at a cost of 60 Euros! I can accept their rules, but the problem is that usually I'm flying multiple airlines. When you fly multiple airlines, you have to somehow live with the tightest restrictions of all of them. I had to change considerably from my usual config -- roll-aboard plus laptop backpack -- to something else just because I would take this short hop on them. In fact what I had to do was, after landing in CPH with my carry-on only configuration (which is how all serious business flyers travel) I had to exit security, rearrange things and check my roll-aboard, then go back through security. This is a pain and adds a lot of time to the transfer. Had my overseas flight been late, I would not have had any option but their 60 Euro gate check. But I did it and time was good. There is an easy fix -- just let people take a bigger carry-on for a fee. Business flyers needing to go on many airlines would pay a reasonable fee -- not 60 Euros. Unfortunately, they had a problem with the plane. Again, this happens. We took off an hour late, knowing I would not make my connection in Riga. What they didn't tell me was that all the other later flights, that day and the next, were full, so they would not be able to fly me out of Riga. Instead, they put Tallinn passengers in a taxi for a 4.5 hour drive, since it's not that far away. They should have just told me that no connection could be made, and put me on a different airline. Several options were available. In fact, I would have been ready to just pay for one and get a refund from them. It is to gain the option to change your flight on short notice that serious flyers don't like to check bags. But I had been forced to, so could not just walk off the plane. Tired, they got me there. But it wasn't over. On check-in for my return I was told, "We see you never used the 2nd leg of your outgoing trip." Airlines don't like people who skip a leg of a trip (usually to do hidden city fares.) They were not going to let me on. Fortunately, my explanation as to why was pretty good. Never again on Air Baltic if there's any other option. Whenever I fly business class (not very often), the food is one of the things I look forward to. I wouldn't like grabbing boxed food from the gate. For coach I wouldn't mind and can certainly see the benefits. I skipped a leg of my flight one time before. I bought round trip tickets to SFO with a stop in LAX, because it was cheap to do it that way. My plan all along was to stop in LAX, drive to SFO, and then fly back home. I left the plane in LAX and got a rental car. I was worried about how the airline would handle it. I called to confirm my return flight (twice). It turned out to be uneventful and flew home as expected. I've never heard anyone talk about it again until now. I don't think anybody doesn't like the fancy food in business class. But for those who fly for a living, the peace and quiet can be more valuable. In spite of the obscene price, a business class seat is still inferior for working to any random desk somewhere, as a bed it's inferior to a bunk in a hostel, and as a restaurant it's superior to a greasy spoon but never going to match a good meal at a decent restaurant. So the question is, why go all out when what people really want to do is travel and sleep. And we want to sleep because you have to sleep, and it makes the trip go by in a way no meal or movie can. Being able to get a full night's sleep turns the red-eye transoceanic flight into a teleporter, and that's the most useful thing of all. You were lucky on that flight, there are many stories of airlines blocking people who fly hidden city. So many that almost nobody does what you did. People will skip the last leg of a one way, or the very last leg (or entire return leg) of a round trip, but never a leg in the middle of a trip when they want to take more. Even that comes with issues. You can't have checked bags of course. If the flight is changed or canceled or delayed, they may put you on another flight -- they certainly don't promise to get you to your real destination. Your case was quite unusual -- you really were flying to SFO. Most people doing this are really trying to get to LAX. Stories also report that those who do this a lot will get penalized by the airline frequent flyer program. If your destination is within taxi range from Riga and you miss your connection, then somehow magically later Air Baltic flights that day and next day are always full. Also magically all the hotels in Riga are full when that happens. I bet they just tell you that to "force" you to take the taxi option, as that is the cheapest for them. Happened to me once, have heard it happening from others. That does not make a lot of sense though. While a taxi shared by 6 people is not that expensive, are you suggesting it's cheaper than filling an empty seat on their plane? It is cheaper than having to over compensation to a person being bumped from a now oversold flight, that I will give you. What could make more sense is that they have 6 passengers and only 3 empty seats. So they need a taxi for 3 of them, and that costs the same as a taxi for 6 of them.